Late last night I had the sudden realisation that Halloween is Wednesday, I know, we bloggers have been talking about it since the start of the month, but time seems to be moving faster than usual at the moment and I totally spaced on (i) decorating the house and (ii) sorting out my outfit. 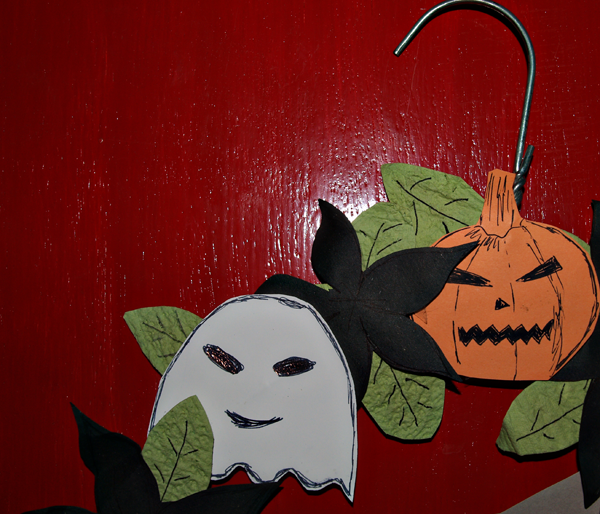 Well, I still have no idea what I am going to wear, but at least I managed to make something festive for the front door. 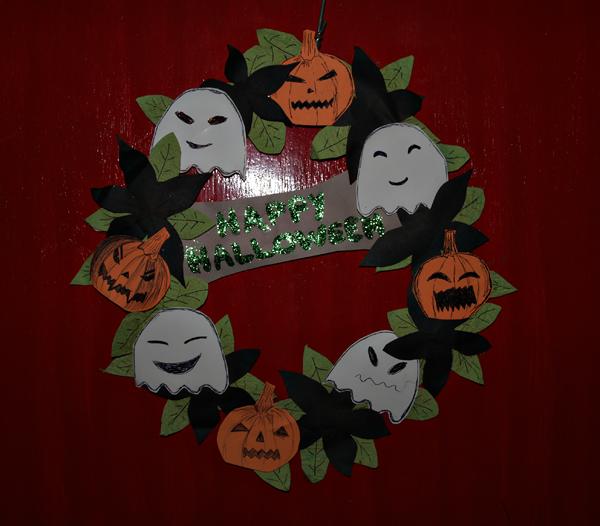 I've seen lots of fancy DIY's to make Halloween wreaths this year, but to be honest there was no way I wanted to spend the same amount of money on craft supplies that I would on just buying one, so I made this out of things I already had in the house. All you need is: a metal coat hanger, someone strong enough to bend a metal coat hanger, some coloured paper, scissors, a black pen and lots of sticky tape. Start by bending the hanger into a rough circle shape, you are going to be taking things to it so don't worry, it doesn't need to be perfect. Mine was definitely more diamond shapes than circular, but if you position the paper properly then no one will be able to tell. Now you're going to want to cut out some paper shapes. I went for pumpkins and ghosts, because that is the colours of paper that I had anyway, but you could do vampires, witches, pretty much anything Halloween themed. I did one of each and then used that as a stencil for the rest of them. Cut then out and then add some details with your black pen. I'm definitely not an artist, but I was quite pleased with how then came out. You're also going to want some bits to fill in between the characters. Again, I went for green leaves and black flowers because that's the paper I already had, but you could also do Autumn coloured leaves in reds and oranges if you want it to be a bit more cheerful. 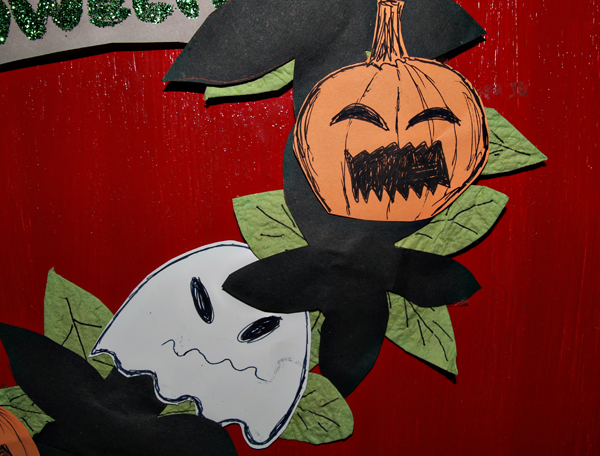 Finally I made the 'Happy Halloween' banner by writing it out with a brush in glue, then covering it in green glitter. Wait a minute then tap off the excess and put it back in the glitter packet. Tape that behind everything else and you are ready to go. Because we are in a rented flat I ended up blue-tacking this to the door instead of hanging it, but the hanger makes it super easy if you don't mind putting a pin in your door. *I have no idea where I saw the idea of using a metal hanger as the base, probably Pinterest, so I can't take any credit for it, if anyone knows who I can credit then please let me know. this is really cute and simple - would be great to make with kids too! !